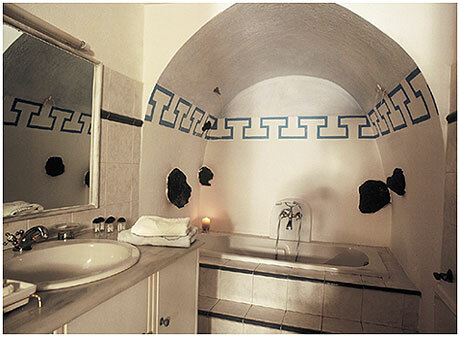 Built in the style of traditional Cycladic architecture, Volcano View Hotel blends perfectly with the Aegean landscape. Located on the magnificent island of Santorini, the hotel is just five minutes from downtown Fira, the capital of the island. A heaven of tranquility between sea and sun, views from our hotel terrace are the most breathtaking in the world. The hotel offers a wide variety of in house facilities to guarantee a care-free holiday. The reception desk is open 24 hours for assistance and enquiries. The complex consists of 55 studios, 11 apartments, 7 maisonettes, 7 junior suites and 2 grand suites. All guests rooms Each offers a private balcony or terrace overlooking the sea and the volcano. They are equipped with individual climate control units, satellite TV, music, direct dial telephones, safety box, kitchenette and hair dryer. We also provide daily maid room service. The ' Caldera ' restaurant is one of the many choices one has to enjoy a delicious meal at Volcano View Hotel. Our exclusive a la Carte restaurant is open for both lunch and dinner. Refresh yourself with some long drinks, fresh fruit juices, or ice creams relaxing by the pool at the Harbour Watch bar. The Cafe Bar is open and a delicious American breakfast is served daily. Είστε ιδιοκτήτης ή διευθυντής στο VOLCANO VIEW; Εγγραφείτε τώρα για δωρεάν εργαλεία, που μπορείτε να χρησιμοποιήσετε για να βελτιώσετε την καταχώρησή σας και να συνδέσετε την ιστοσελίδα σας και το σύστημα κρατήσεών σας.